Any individual that wishes to rent a party bus and lives in the Ferndale area can stop their search immediately. Here at Rockstarz Limousine and Party Bus, we specialize in providing our clients with an amazing time from start to finish no matter the reason for the celebration. When looking for a party bus in Ferndale, you will have a number of potential concerns that you will want to have answered. The main one will often be the space in the bus, and we can assure you that you will not be disappointed. We have designed our buses to get the maximum amount of space to allow you to have as many guests as possible with everyone having a great party. 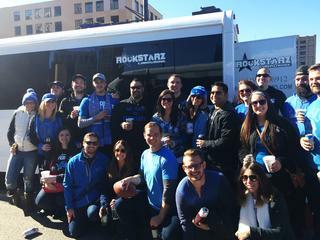 Our Ferndale party bus rental service provides you with a professional driver as well as a top of the range sound system that is going to play that music at full volume. Also, our laser light display will have a major impact on your guests as it adds that extra bit of atmosphere to the surroundings and will make you believe that you are indeed in your very own private nightclub. Previously, individuals have used our Ferndale party bus service to celebrate a wide range of special occasions. Whether it be a birthday, a bachelor or bachelorette party, or any kind of celebration, our party bus can accommodate you and your guests and provide you with the perfect backdrop. So, any individual that lives in the Ferndale area and who is seeking a party bus for a celebration should give us a call here at Rockstarz Limousine and Party Bus. Alternatively, you can contact us via our website and a member of our team will be in touch as quickly as possible in order to discuss your requirements.